SINGAPORE - There will be 12.5 per cent more certificates of entitlement (COEs) for the next three-month quota period starting from August. In a statement on Thursday (July 12), the Land Transport Authority said there will be 9,225 COEs a month from August to October - up from 8,202 currently. Car buyers will have 6,912 COEs a month, or 5.7 per cent more than now. Motorcyclists will get the biggest increase, with their quota rising 55.7 per cent to 1,639 COEs per month. Industry watchers expect the expanded supply to further dampen premiums, which are now at their lowest in almost 10 years for cars. In the latest bidding exercise on July 4, the premium for cars up to 1,600cc and 130bhp fell by 26.7 per cent to $25,000. The COE price for cars above 1,600cc or 130bhp dropped by 8.6 per cent to $31,000. 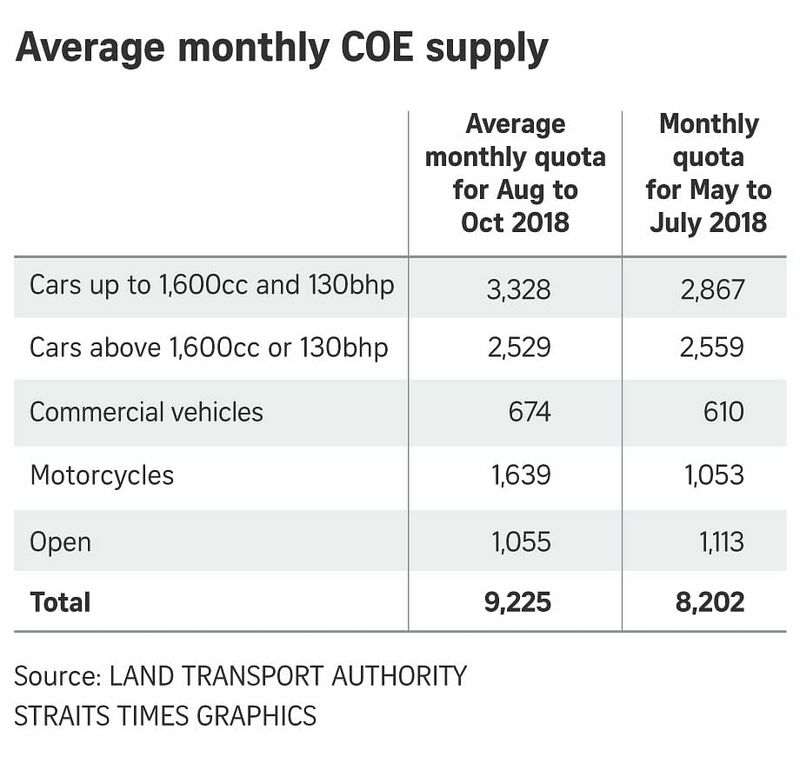 The premium for Open COEs, which can be used for any vehicle except motorcycles, but which are used mostly for cars, fell by 9.9 per cent to $31,001.